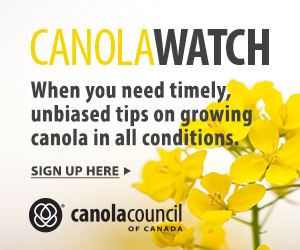 Canola has high potential for seed shatter, and seed losses at harvest can be substantial. Researchers are trying to find and test methods to improve genetics and machinery to reduce losses. However, they need more efficient tools to measure those losses. At this time, no proven time-efficient tools are available to estimate pod drop and pod shatter accurately and consistently. This project was designed to improve research tools. 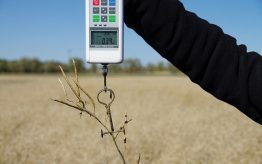 The vacuum method (please see the photo with the Limit loss article) is the current standard for measuring pre- and post-harvest loss, but it takes a lot of time and tedious work to achieve accurate results. It literally means vacuuming up all fallen material on the soil surface, including pods and loose soil. How do the visual rating and tray-based methods compare for determining pod-drop and seed-shatter? Can digital images be used to estimate pod-drop and seed-shatter? 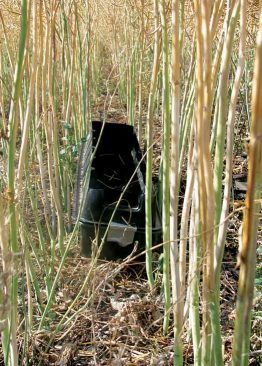 Can pod retention resistance be quantified quickly and reliably and is this measurement related to pod-drop in canola? Are there fundamental differences in pod-drop and seed-shatter between open-pollinated and hybrid canola varieties? Field trials were conducted in 2011 and 2012 at Carman, MB and Kelburn Farm south of Winnipeg, MB to compare the methods. Field studies compared eight different canola varieties — four hybrid and four OP — at two different seeding densities. The visual rating and catch tray methods improved time efficiency. However, the visual rating method only provided a good measure of seed-shatter, it did not measure pod drop. The catch tray method provided good estimates of both pod drop and seed shatter. Data generated from this method was comparable to the vacuum method. Digital force gauge tool in action in the field. Pod retention resistance was measured using a new force gauge method. The gauge measures the force required to tear the petiole of the pod from the rachis, the weakest point of attachment. This provided quantitative data on pod-drop potential for each variety. Refinement and validation across a more broad range of germplasm and different environments are required. 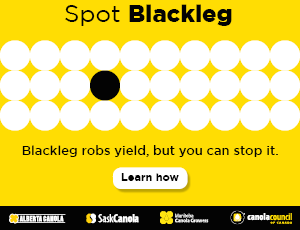 Digital image analysis used cameras to identify dropped canola pods and seeds. Trays used to determine pod-drop and seed-shatter in canola before harvest. In 2012, catch trays were modified by adding a top section to reduce possible predation and/or the effect of adverse weather conditions. Identification of canola pods against a soil background was possible in the greenhouse experiment, but identifying them on a clean soil background was more challenging due to their size and colour. Analysis of images collected in the field was even more challenging. Current software does not have the capacity for shape and size recognition, and it was not possible to adapt the software for rapid pod or seed recognition from field images. Therefore, this method cannot provide rapid and efficient data generation at this time. Generally, seed shatter and pod-drop losses were similar for hybrid versus OP varieties. There are differences among the varieties that were tested. Pod-retention resistance was remarkably consistent for individual varieties over years and locations. The study found that pod retention is not affected by moisture content.